BALN is a brown fused aluminum oxide obtained from the refuction of high quality bauxite in an electric arc furance . Due to its toughness, BALN is recommended for use in bonded abrasives(grinding wheel, cutoff wheel, points, etc...), coated abrasives (paper & cloth), blasting abrasives, as well as refractory applications. 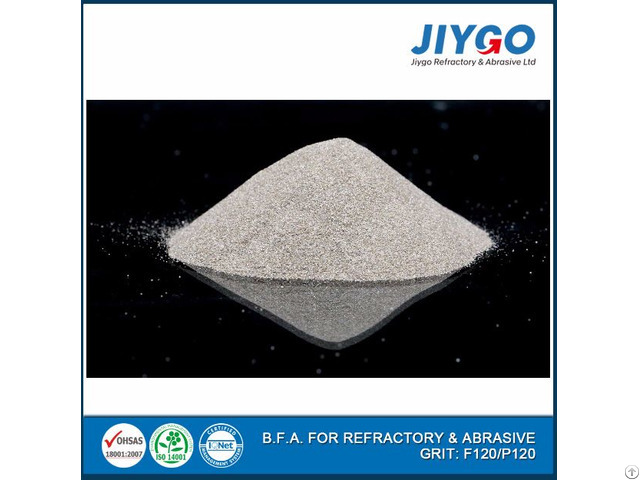 Posted By: Jiygo Refractory & Abrasive Ltd.
Business Description: Jiygo, founded in 2003, is the main Brown Fused Alumina manufacturer in China with a production capacity of over 50,000 tons. Strengthened by quality ore and know-how in the BFA industry, Jiygo strives for the highest product quality and levels of customer service and has reinforced this goal with two teams fully dedicated to ensuring this: one is focused on production quality and process consistency as well as the other to customer support and service. Jiygo is the only one BFA manufacturer in China who owns the full production lines from bauxite calcining to BFA block crushing and screening. This advantage enables Jiygo to provide products not only BFA, but also calcined bauxite along with meeting established ANSI, FEPA, JIS and individual customer specifications. These products are sold for use in numerous industries and applications, mainly for steel production (refractory) and grinding wheels (abrasives). Today, Jiygo is well-know and recognized, as a new star at global market with rapidly increasing.Our sales and technical team is at your disposal to offer the full range of products and provide the industry solution that better fulfill your requirements. Do not hesitate to contact us for more detailed information.